Do press the shiny red (ActionTiles) button! Imagine if Stimpy tried to manage a Smart Home? Moving further down the road of my smart home automation insanity, I’ve started looking for a panel to control things around the home. The paradigm I was looking for is not very different from a home security alarm control panel. I wanted a wall mountable or tabletop touch screen to use when Alexa goes down, or if voice commands are not convenient. As I am going away for a few weeks, I wanted to make sure there are multiple ways to control the home in the case that anything went sideways. No single points of failure to destroy WAF here! 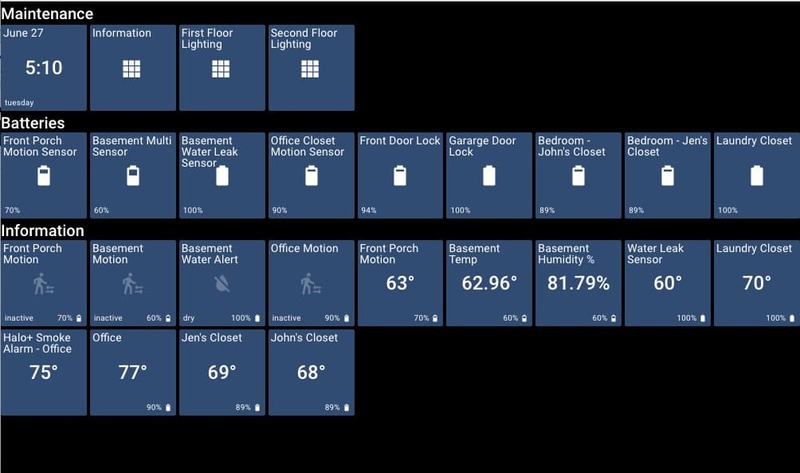 To make this work, I found ActionTiles, a web-based panel system for the SmartThings ecosystem. I had an older 7″ Samsung Tab4 tablet collecting dust which made for a perfect prototype platform. In all, I created four panels, one each for the first and second floors, one for information/weather and a final one for maintenance needs (battery levels, status, etc.). I signed up for their 14 day free trial initially, and a couple of days into the trial I paid for the license. It was that good. 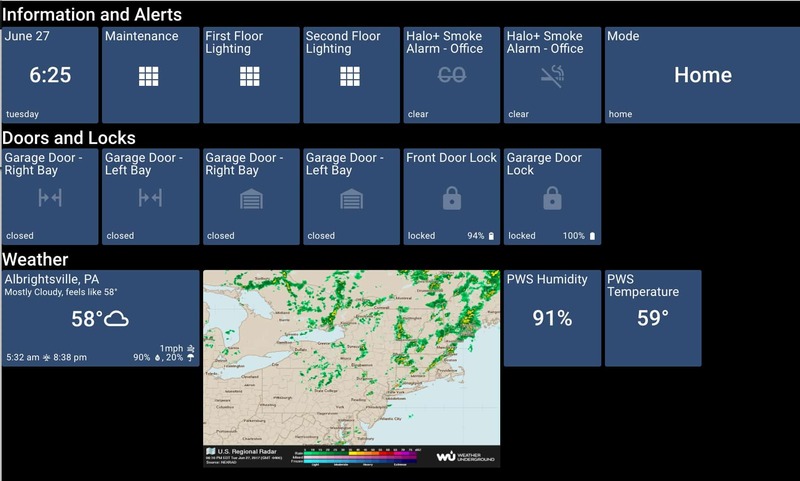 There are still things I would like to be able to do such as custom CSS for layouts, play video feeds, perhaps pull in data from services not directly tied to SmartThings’ ecosystem – but overall ActionTiles has been great. 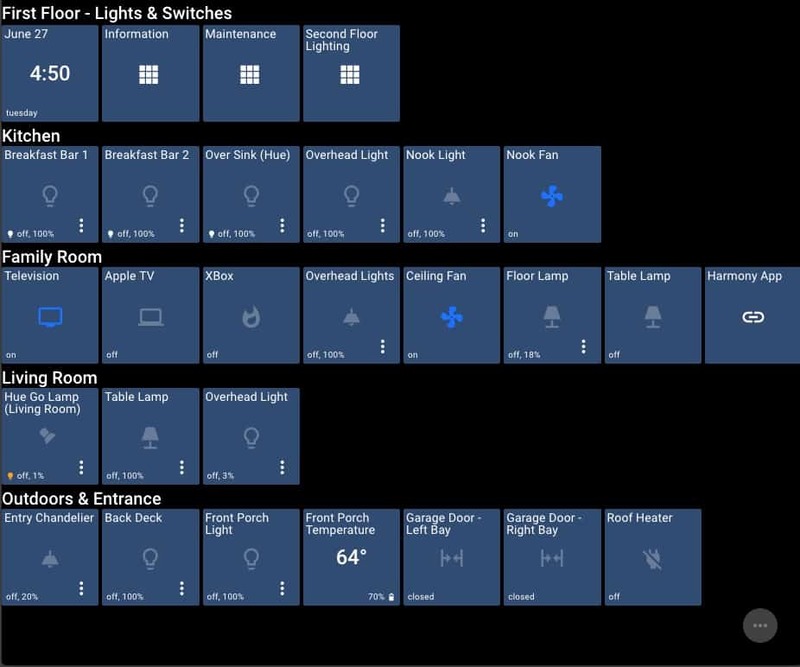 Each of the tiles on the panels either turns on / off a controllable light or switch and if supported by the device you can drop down a color and dimmer selector to get things set like you want them. There are a few things I would like to better control, such as bulbs that can do color and white temperatures only showing selectors for the color settings, but these are minor issues that will work themselves out. Once I get back from my next business trip, I am going to be looking for a wall mountable tablet and finally figure out how to get kiosk mode running with stability to really make this a complete solution. This entry was posted in SmartHome, Technology and tagged home automation, iot, smarthings, smarthome. I like the ActionTiles but I wish you could do groups of things, like lights. I believe it is a limitation of Smartthings. 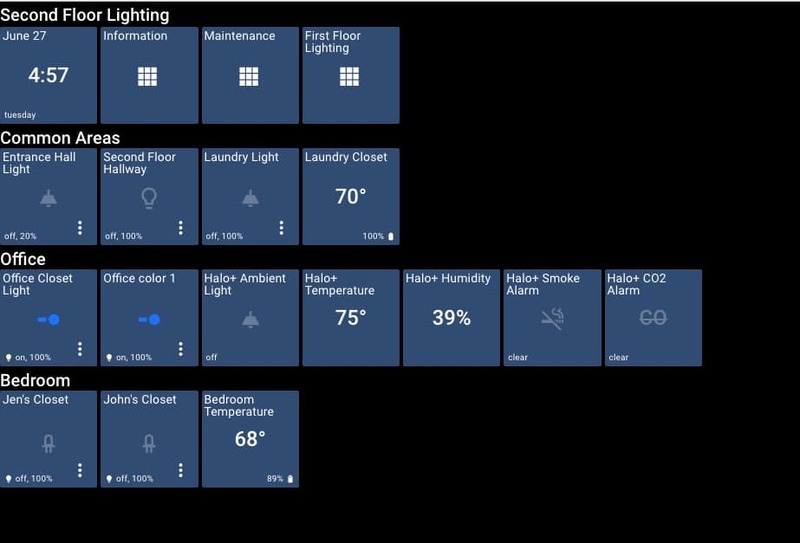 ActionTiles, from what I gather, is ‘limited’ to what you have configured within SmartThings, so you could create a Virtual Switch and control all the lights that way for example. I’m Terry … just one half of the ActionTiles team here; feeling humbled and proud for your sincerely “insane” love note showing off your efforts with our product. Can’t thank you enough; so just wishing you a happy smart home and many more home automation adventures! Drop us a note anytime. Terry – thanks to you and the other half of ActionTiles for this! Setting up the Smart Home bits was the easy part … making it work intuitively and cleanly … that was another animal all together. Voice control via Amazon Echo is nice, but the service goes wonky now and then so having a panel around to maintain usability is great! Now if only there was a way to integrate ActionTiles with Amazon Show’s touch screen – that would be simply perfection. Really appreciate ‘good design’ that does exactly what it should .. AT meets this in spades!